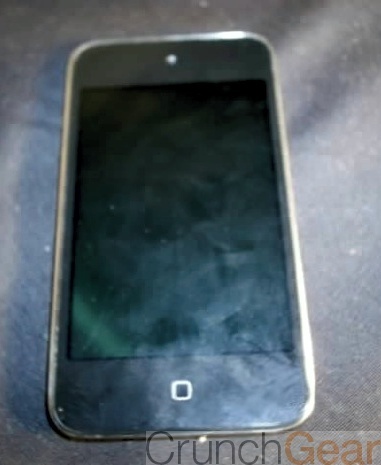 Although I’m tending towards skepticism on this one, it could be that these blurry-cam photos of a potential iPod Touch with non-physical home button show an example of some sort of aborted trunk on the iPod Touch family tree with to a seamless, button-free face. Talking heads have been touting this button-free model for a while now and so these images lend credence to that direction in Apple iPod/iPhone trade dress. Marked with the “DVT-1” badge found on the earlier examples of the iPod Touch discovered in 2010 that sported front and back cameras, this model has 128GB of memory, is running firmware 4.2.1MC14 and is marked model MC550LL (zoom in here) which points to a Mac Pro model as well as a permutation of the 4th Gen iPod Touch. The device also has an aluminum back, the same back rumored to exist on the unreleased iPhone 5. Considering the firmware is so old on this test model, it’s clear that it’s been floating around somewhere for a while now, possibly a testing room or recycler. I’m not sure what I think about a non-physical home button, either, although a capacitive one would reduce possible wear and tear on the device over time. Further sleuthing finds that the photos were ostensibly taken with an old Samsung Digimax A402 first released in 2005. Regardless of provenance, enjoy the blurry photos.